Cream butter, sugar, egg yolks and peppermint extract. Mix in flour. If you want plain cookies, simply roll dough into a long (about 2 feet), thin log. If you want solid-colored cookies, add in 5-6 drops of your choice of color and mix thoroughly. 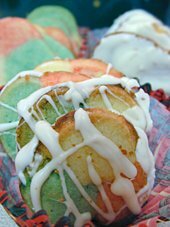 If you want to make the tri-colored cookies shown, divide dough into three equal batches. 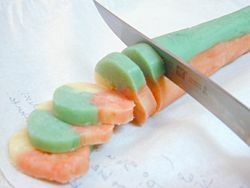 Leave one plain, color one with red food coloring and one with green. Roll each batch into a long rope (about two feet long). Stack them together like a pyramid (see slicing photo, below). Wrap dough in plastic wrap and chill for a few hours. You can refrigerate the dough for up to a week, or divide long log into two rolls, wrap tightly in foil, and freeze until you’re ready to use it. Preheat oven to 400 degrees. Unwrap cookies and slice into thin (1/8 – 1/4 inch), uniform discs. Bake on ungreased cookie sheet for 7-10 minutes, depending on thickness. Remove to wire rack to cool. Spread or drizzle with melted white chocolate or royal icing, if desired. This entry was posted on Thursday, September 13th, 2007 at 6:28 am	and is filed under Desserts, Holiday & Seasonal, Master Recipe Index, Vegetarian. You can follow any responses to this entry through the RSS 2.0 feed. You can leave a response, or trackback from your own site.